My name is Ivette and this is my first blog attempt. I will try and make it interesting. I have 2 dogs, 2 cats and one horse. 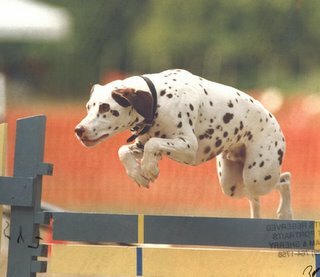 I have been doing agility with my dogs for the past 8 years. My first agility dog was a Dalmatian, Reese. We competed in USDAA and AKC trials. 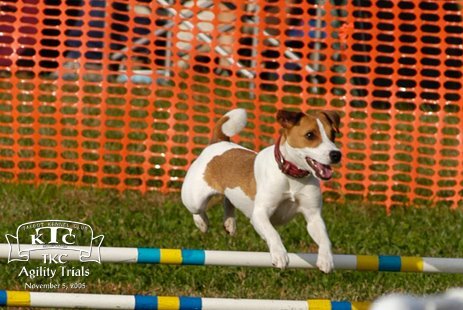 Although Dals can be a challenge to train in agility, we were able to recieve our Novice Standand and Novice JWW titles and were working on our Open titles. Unfortunatly Reese passed in Nov. 2004. I got Dasher in the spring of 2005. He is my first small dog. He is a joy to have around. His tail is always wagging. 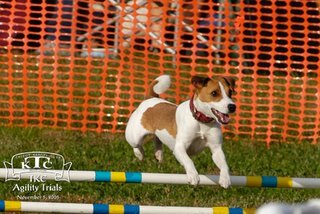 I got Dasher from my agility instructor who also breeds JRT. I knew if I was going to get a JRT I would defenitly want one of Jeanette’s dogs. Her dogs have the temperment I was looking for in my next agility dog. Here is a picture of Dasher at our second show ever.